Listening to how quickly an uptick in juvenile crime has triggered calls for harsher penalties, I can’t help fuming over how slowly Maryland has responded to the institutional misdeeds that, over the decades, helped cause this problem. From the public, outside of advocates for Baltimore’s under-resourced primarily African-American schools, it was crickets. In truth, what the Kirwan Commission lacked was not time or higher math skills, but public support for changes everyone knows will be unpopular outside of Baltimore – especially on the eve of statewide elections next year. This was never a dry bureaucratic exercise. Stop and think about how much extra we spend to provide what we call an adequate education to middle-class kids. Tutors, violin lessons, sports, guidance counselors, lab facilities, great teachers – that is the advantage, the thumb on the scale, that would be matched if the Kirwan Commission would get its act together. 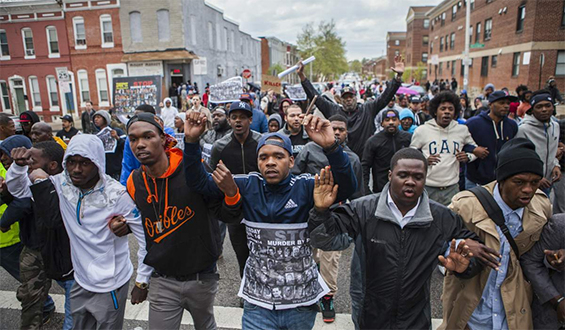 Think of all the students in Baltimore, most of them black, who attend schools without these resources and, through no fault of their own, live in severely distressed neighborhoods. Charged with overhauling the 2002 formula that distributes school aid and allows this imbalance, the Commission on Innovation and Excellence chaired by retired University of Maryland chancellor William E. “Brit” Kirwan, had a December deadline to release its report. Now the whole endeavor has been shelved until after the legislative session ends next spring. Let’s look at the institutional structure that keeps things the way they are. The U.S. has a unique way of funding its schools – using local property taxes as its main source of revenue. 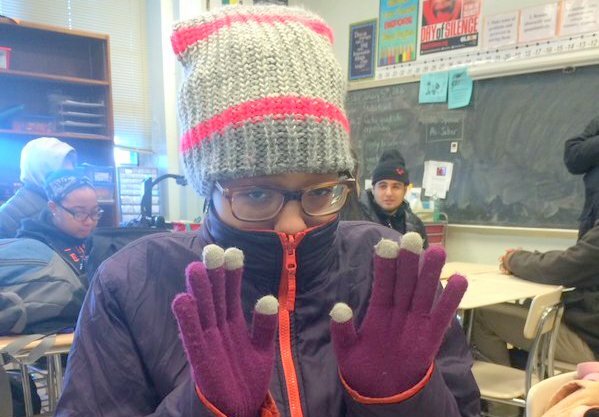 Students at City College last year wearing hats, gloves and coats in the classroom during one of the periodic boiler malfunctions at the school. Families who can afford it, generally move to affluent communities. Those who remain in low-income communities have less taxable income to fund schools and, therefore, their children have to attend schools that lack the basics. Their school may not have enough heat in the winter or clean drinking water or access to technology or experienced teachers. These are the conditions in Baltimore’s historically red-lined communities of color, which are now pockets of highly concentrated poverty. Year after year, parents, teachers, students and advocates have argued that the inequity inherent in the way Maryland funds its schools must be addressed. Others say that those who have worked hard enough to earn their way into an affluent community deserve better schools, and their obligation to equity ends there. This is how too many taxpayers and political leaders see it. But our better angels say that all children need an equal chance to succeed. The Kirwan Commission was formed to revisit the funding mechanism approved 15 years ago under the Bridge to Excellence Act, which required the state to distribute school funding more equitably throughout Maryland. That effort succeeded insofar that it required more funding for poor districts. But the 2008 recession forced the state to backtrack on its commitment to provide equal funding to all of Maryland’s districts. 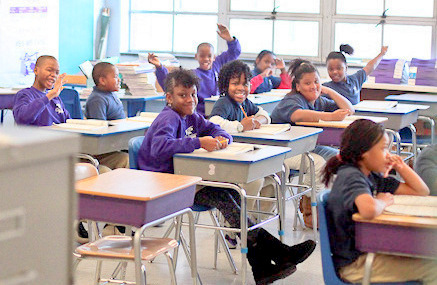 The recession happened 10 years ago – and Baltimore’s schools never got what they were due. So why can’t the Kirwan Commission come up with the equity solution advocates hoped for? Officials have said that they have been consumed by other education issues, like teacher preparation and early childhood education. Those areas are important, but they are no excuse for the failure to act. Political leaders move swiftly when there is pressure, but they haven’t gotten any pushback from the majority of Marylanders who benefit from the educational funding status quo. There are enough people who have the money to buy houses in well-funded districts, pay for enrichment activities or hire tutors for their children when needed. So, their thinking goes, why change the formula? Political leaders haven’t gotten any pushback from the majority of Marylanders who benefit from the educational funding status quo. Many also argue, especially when it comes to Baltimore, that putting more money into a school system that isn’t producing results is a waste of time. Certainly, schools need to change and accountability is important. But even the consultants hired by the Kirwan Commission have said that the city school system is owed 45% more in school funding than it is receiving. We know that it takes more to educate students in need. That is why the original recommendation in 2002 was to increase school funding to Baltimore. The reality is that the best way to get “results,” frequently measured by test scores increases, does not come solely from more school funding. Inadequate as test scores are as a measure of student achievement, they do reflect family income. So we if want to improve scores, the best course of action would be to provide better paying jobs so that low-income families can accumulate wealth, live in stable housing, provide enrichment for their children, and have regular access to medical care. Changing the structural conditions that segregated Baltimore faces is the real answer to improving education. Until we seriously address the inequalities that have enshrined racism in the city and elsewhere across the state, the issues of poor test scores, inadequate schools and, yes, juvenile crime will continue to fester. Jessica T. Shiller, an associate professor at Towson University, is the author of “The New Reality for Suburban Schools.” She has researched and written extensively about urban school reform.